Valentine's Day is just round the corner and if you are still searching for the perfect Valentine's Day gift for your man, you have come to the right place. I have put together a list of some nice gift ideas for him. Take a look and you might find something suitable for your man. The first brand to be featured in this Valentine's Day guide is one that Mr.H likes quite a lot - The Bluebeards Revenge. Their EDT is one of his favourites. What began life as a barbershop-quality shaving range aimed at men with tough stubble has today grown into a very popular grooming brand with products ranging from beard oils and moustache waxes, soaps & body washes to shampoos & conditioners and moisturisers & fragrances. Featured in the gift guide is the Bluebeards Revenge Cut-Throat Razor Kit which is priced at £34.99 and includes 100ml shaving cream, 100ml post-shave balm, one Doubloon bristle shaving brush and a cut-throat replaceable blade razor. The Flexball razor uses Gillette's most advanced cartridge yet. Fusion ProShield lubrication before and after the blades helps to shield while you shave. In addition, the Chill features Cooling Technology during the shave. Other key features of the razor include the FlexBall Technology that responds to contours and gets virtually every hair and the 5 precision blades that ensure there is less tug and pull for incredible comfort. The blades fit all Fusion and ProGlide handles. The UK’s No. 1 Korean mask brand MasqueBar recently launched their first men’s mask collection BANDITO. Featuring four fun and easy to use 'outlaw' inspired face masks, the range includes two sheet masks, a mud mask and a cream mask. Keep it Smooth Sheet Mask : Formulated with Green Tea Extract and Vitamin E, this sheet mask leaves skin soft and hydrated, as well as helping to reduce the appearance of wrinkles. Chill A Minute Or 30 Cream Mask : Infused with Lemon Fruit Extract and Vitamin E, this cream mask will leave skin feeling radiant and refreshed, whilst minimising the appearance of pores. Pimped Out No More Mud Mask : This mask has been designed to help to purify the skin's complexion. The mask contains Tea Tree and Vitamin A to calm irritation and banish blemishes. Get Lucky – Night On The Town Sheet Mask : Will leave skin feeling brighter and more radiant. The mask also helps to reduce the appearance of dark spots due to the presence of Orange Extract and Vitamin C.
If you are looking for a personalised gift then head to www.giftsonline4u.com. 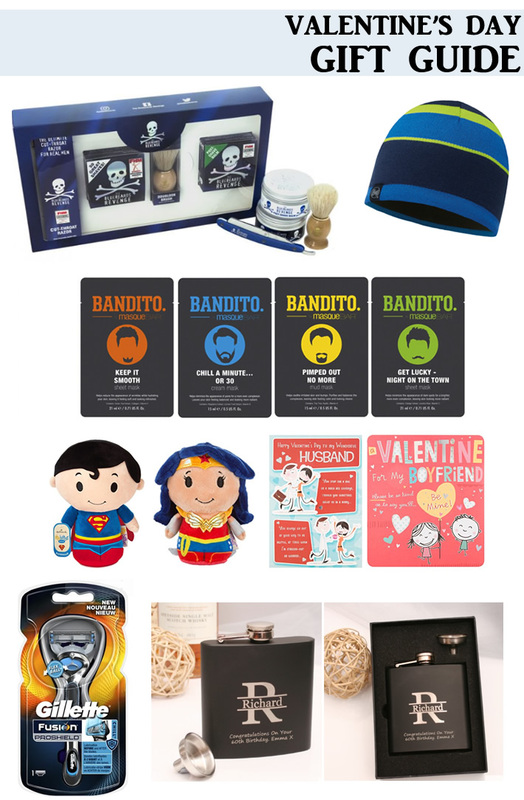 They are an online gift shop that specialises in personalised gifts of all kinds. Whether you are looking for an engraved gift or personalisation of any other kind, giftsonline4u is the place to find it. When I had the opportunity to try out their personalised gift service, I headed to their website and was bowled over by the vast choice. After spending more time browsing through the choices than I had anticipated, I zeroed in on a stylish black hip flask that comes with personalised engraving. I wanted to pick a personalised Valentine's gift for Mr.H this year and the hip flask was perfect. Made of stainless steel with a black coating, the gift set comes in a black box with contoured foam insert. A refilling funnel and 2 cups are also provided. The build quality and presentation was excellent. And the best part was the stunning laser engraving. You can add an initial and name (up to 12 characters) and a message under the monogram of up to 50 characters over 2 lines. The personalisation was very easy and once my order was placed, I received a confirmation email and the package arrived in a couple of days beautifully packaged. I was impressed! If you plan to buy an engraved gift for him, then head to GiftsOnline4U. In addition to Valentine's Day, they have gifts for a range of occasions including for birthday, wedding and anniversaries.